Energy conservation is not only important for cost savings, but also to protect the environment from wasteful energy consumption and unnecessary carbon emissions. Atlas EnergyShield products improve the efficiency of a building’s envelope, helping to earn LEED® credits and meet federal, state and local green building laws. Our manufacturing processes are also sustainable and responsible, with polyiso using fewer resources to achieve the highest insulation levels, thanks to its high R-value per inch. 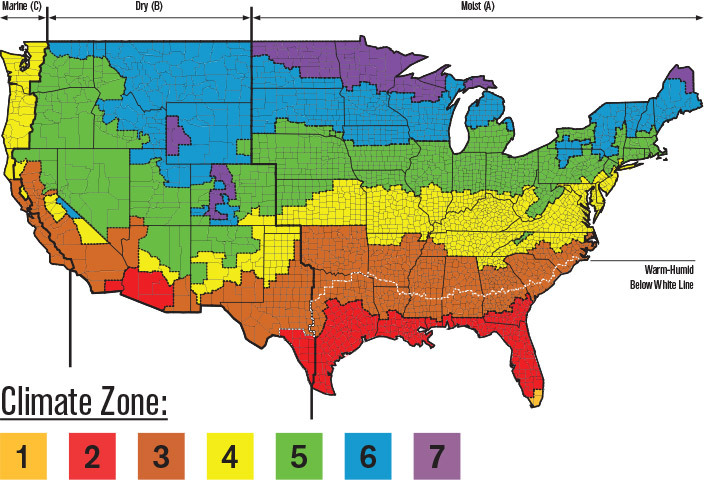 Atlas wall products have zero ozone depletion potential (ODP) and virtually no global warming potential (GWP), helping cut HVAC energy and carbon emissions. Atlas continuous insulation products can help your project achieve LEED or many other green building aspirations. Any level of LEED certification includes careful attention to building materials. 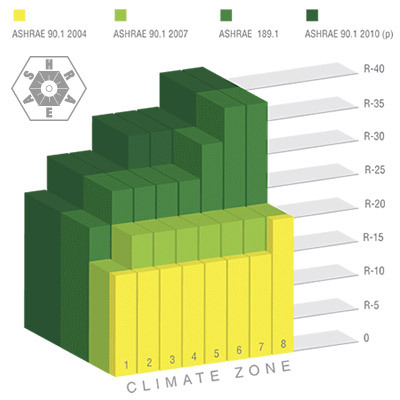 Factors such as, how far materials were shipped and how those materials were manufactured, affect potential LEED point accumulation. Performance of materials once your building becomes functional will also be critical. Wall CI has been proven the most effective way to insulate in order to maximize your facility’s energy efficiency. Remember that traditional insulation only insulates between framing space. Those wooden studs or metal frames that sit between walls, lose large amounts of energy. Because framing material most often contacts both the inside and outside of wall surfaces, they facilitate energy transfer, also known as thermal bridging. The studs within the frame act as a bridge, allowing the flow of energy between the outside and inside environments of the structure. Estimates indicate that for steel-framed buildings, thermal bridging causes a 50% or more reduction in a wall’s R-value. Continuous insulation sits between the structure’s frame and the ambient environment, thereby blocking the thermal bridge. Continuous insulation systems help to meet compliance with a large group of environmental certifications and building standards. Their use helps earn LEED credits and meet IGCC or ASHRAE 189.1 as well as state and local green building laws, such as California’s CALGreen. Due to its high thermal efficiency, zero ozone depletion potential, and negligible global warming potential, polyiso wall continuous insulation makes an ideal choice for LEED building design. If you’re planning a project, and LEED will be part of your requirements, contact Atlas. One of our continuous insulation experts can help you plan a path toward LEED certification. Thermally efficient Atlas Wall CI boards facilitate compliance with ASHRAE 90.1/IECC and local energy codes. Atlas Wall CI provides the highest thermal resistance per inch of material and can economically contribute to achieving one of the LEED levels of optimized energy performance. Wall CI boards provide exceptional energy performance due to their ability to prevent thermal bridging. Wall CI provides a major impact on a structures potential energy use. LEED v.3 requires a 10 percent reduction over ASHRAE 90.1-2007 for new buildings and an Energy Star performance rating of at least 69 for existing facilities. Recent research has begun to elucidate just how much energy thermal bridging wastes for the average facility. 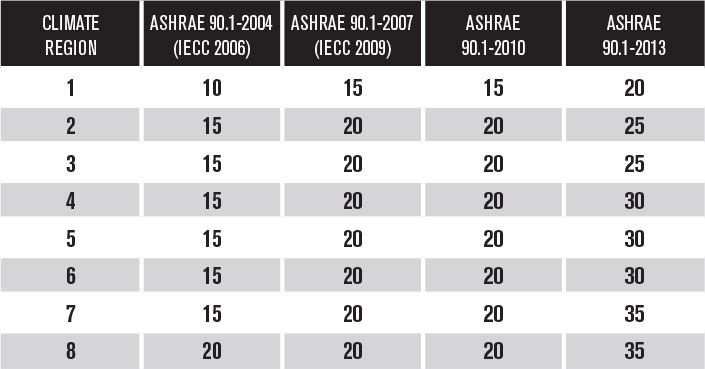 Incorporating Wall CI, thereby reducing thermal bridging, can increase your building envelope’s R-value substantially. With LEED’s incremental scale in this category based on reducing energy usage, Wall CI can help achieve as many points as possible up to the maximum of 10. Beyond LEED certification, the energy performance benefits of Wall CI last for years. Overall energy savings by facility owners may be just as valuable as the LEED credits themselves. Atlas Wall CI boards can be cut in multiple sizes. More exact sizing means less waste at the project site during construction. Depending upon its original use, Atlas wall continuous insulation can be reused. Reusing materials provides the added benefit of reduced demand for virgin materials, reduces waste and shrinks the overall waste footprint of your project. Atlas Wall CI can be used toward one of the levels of recycled materials credit. Speak with the Atlas account executive for your specific region to get product specific information pertaining to each project. Atlas has eight polyiso insulation plants and sources of raw materials across North America—that’s more than any other polyiso manufacturer. That often also means shorter shipping distances from an Atlas facility to your project site. Therefore, the use of Atlas Wall CI may contribute towards gaining this credit, depending on the project location and the version of LEED being used as the basis of design. Speak with the Atlas account executive for your specific region to get product specific information pertaining to each project. FSC-certified wood when used in products where Polyiso is bonded to the wood can contribute to gaining this credit. For more information on Atlas LEED Potential, please Contact Us for specific details on wall continuous insulation you are specifying for your project.